…….so why airbrush Narasimha Rao out of history? Rahul Gandhi’s triumphant foray into Mumbai last Friday, where he successfully challenged the street power of Maharashtra’s chauvinist Shiv Sena politicians, was a significant step forward in his emergence as a national figure. By using local trains instead of a planned helicopter to cross the city, he showed more courage than most of India’s prestige-oriented politicians would contemplate. Together with his message that “India is for all Indians”, this undermined the Shiv Sena’s sometimes violent campaign to exclude north Indians from jobs in booming Mumbai. This underlined the political standing of the Nehru-Gandhi dynasty, led by the family trio of Sonia Gandhi, leader of the Congress Party and the governing coalition, Rahul, and his sister Priyanka. The strength of this trio, supported by top politicians who now do not dare challenge their dominance, was well illustrated by an intriguing list of the 100 most powerful Indians published on January 31 by the Indian Express newspaper. I was planning to write a post about this 100 list last week before Rahul Gandhi’s Mumbai tour (right) because, though the Indian media regularly produces lists of top people with little apparent research or firm criteria, the Indian Express list is noteworthy – for two main reasons. One is extent to which the dynasty is embedded, which leads me on to the thought of why the family still apparently feels unable to give Narasimha Rao, Congress prime minister from 1991 to 1996, his rightful place in history – especially as the instigator of India’s 1991 economic reforms, and the initiator of prime minister Manmohan Singh’s political career. The other noteworthy reason is the absence near the top of the list of foreign policy experts. At number 30, there is political newcomer and star tweeter Sashi Tharoor, a former senior United Nations official and now a junior minister in the External Affairs Ministry. Then at 36 there is Shivshankar Menon, a former foreign secretary who has just become national security adviser. Neither the foreign minister or foreign secretary are included, which underlines the prime minister Manmohan Singh’s intention to be his own foreign minister, aided by Menon, especially on India’s relationship with Pakistan, where India has just offered talks. But the absence of any broader-based top foreign policy makers or strategists underlines India’s problem that, while it wishes to have a significant and positive influence internationally, it has had no coherent long-term policies since the fading of the Non-Aligned Movement, nor the necessary diplomatic manpower in the external affairs ministry. More on that another time. Going back to the dynasty or “the family” as it is frequently known, at number 1 in the Express list there is Rahul Gandhi, 39-year old heir apparent to the leadership of India’s Congress Party and thus in line to be prime minister in the not too distant future. 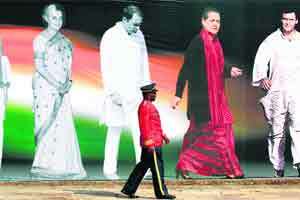 Sonia is at number 3, with Manmohan Singh, a family loyalist, slotted in between them. Then there is Rahul’s 38-year old sister Priyanka at 14, and his 31-year old closest aide, Kanishka Singh, at 23 – the latter, it’s worth noting, three slots ahead of the prime minister’s veteran principal secretary T.K.A.Nair. Rahul has had the No 1 slot for two years. I’d have put Sonia there because of her potential veto power over any government policy though the Express’s senior editorial team, who drew up the list, have however presumably spotted Rahul’s growing influence over what Sonia says and does, and the space that she is leaving for him to occupy. 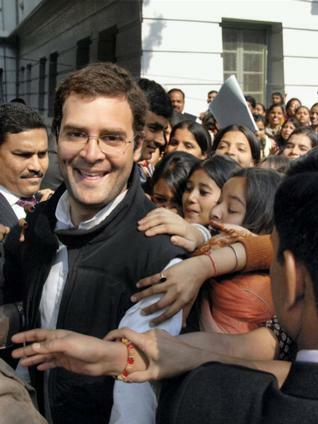 Rahul has sensibly refused to be locked away in a government department and is busy rebuilding Congress’s tattered organization at the grass roots in states such as Uttar Pradesh and Bihar – a good thing to do while he can spare the time before taking on bigger responsibilities – as well as making Mumbai-style forays elsewhere. Also significant is Priyanka moving up from number 30 to her 14. The Express says she’s there because she is close to her brother, and her influence grows with his. I’d have added her emergence running Rajiv Gandhi Foundation, which focuses on development issues. Founded in 1991, it has also operated as a policy think tank but, along with its stylish modern building in central Delhi, it has decayed and needs reviving. Priyanka’s very active involvement there, along with her organisational activities in Sonia’s and Rahul’s political constituencies, indicates a steadily growing public role. So why, now the family’s current and future position at the centre of India’s politics is so secure, can’t they acknowledge Narasimha Rao’s important contribution, especially since he neatly filled a dynastic void between Rajiv Gandhi’s assassination and Sonia’s entry into active politics? At the Congress Party’s 125th celebrations just over two months ago, all of India’s Congress prime ministers – those from the dynasty plus Lal Bahadur Shastri and Manmohan Singh – were paraded in pictures and mentioned in speeches, except for Rao. Instead, Sonia Gandhi emphasized the role of Rajiv when he was prime minister from 1984 to 1989 and said that he “left his personal imprint on the party’s manifesto of 1991”. While it is correct that Rajiv, who was assassinated during the 1991 general election campaign, expanded the reform path tentatively started by his mother Indira Gandhi, his contribution was far less significant than Rao’s. It was Rao who had the political courage to launch wide-ranging reforms when India was hit by a major financial crisis in 1991, instead of just tinkering enough to keep the international financial community content. He then picked Singh to lead the reforms as his finance minister. He should also be remembered for two important initiatives in foreign affairs – introducing India’s “look east” policy, and seizing an opportunity to establish diplomatic relations with Israel. Of course, he also made mistakes – most importantly in the context of this post, not keeping Sonia Gandhi as an ally, or at least making her feel secure. He also failed in 1991 to curb the Bharatiya Janata Party’s yatra that resulted in the demolition of a mosque in the city of Ayodhya, sparking religious riots across the country. And he initiated a self-defeating crisis over corruption and hawala (illegal international money transfers) just before the 1996 general election. It might be understandable if Rao’s portraits do not stand as high at Congress Party functions as the dynasty’s, and that praise is less fulsome. But the negatives do not warrant his exclusion from the Congress leadership’s version of history. Surely Rahul Gandhi, who is trying to attract new young talent into a more democratically run Congress Party, will understand this. Recruits might be attracted more if he can show that praise for achievements goes to all Congress leaders, maybe even to critics – and what better way to demonstrate that than to rehabilitate Rao. It is sad how Nehru family with no concept or policy is dominating as a dynasty in INDIA. Indira Gandhi was a worst dictator. Due to the poor people who are illitrate the dynasty is existing. Rahul Gandhi claims to have completed his education in Harvard he droped out he was addmited there due to influence . I live in the US and was born in India Educated and uneducated people vote for the Nehru family. Nepotism causes conflicts of interests and leads to Oligarchy of political families. Rahul cannot be allowed to continue in politics as an MP or Assemblyman, much less Minister or heaven forbid more for at least 2 generations at least. If every MP’s son or daughter became MP, every PM’s son or daughter became PM, India’s democracy would have ended as we know it. Compare with PAS Malaysia’s Datuk Nik Aziz Nik Mat’s son-in-law to see the difference between hunger for power/greed and incorruptible application of ethics is. The Gandhi name means spirituality/freedom and higher things, NOT embedded politicians. If the Gandhi or Nehru or any other embedded family understands what ethics are, they would immediately relinquish all political positions for 2 generations. If the grandchild of Rahul Gandhi enters politics then, we could say that shadow elite networks formed during Gandhi’s time would have diluted sufficiently that conflict of interest would not occur to any significant degree, although it is still possible and that former allies of his granfather if still active might be prohibited from communicating with the said grandchild. Please all citizens of India and world citizens, be aware of this, and never support such products of Nepotism in the public sphere of governance. It is not only destructive to democracy but spiritually unclean to the worst degree and a sin against mankind and free will. Look at the site below for an idea of what could be considered conflict of interest and extrapolate on it, and strengthen it not water it down. I don’t quite understand the connecting theme between the beginning of the article and the follow-through observations on Rao. Further, do please have a look at the 1991 Congress Manifesto written when Rao had opted out of the 1991 General Election and which spelled out the steps to be taken in the Reform process. And, do please recall India’s dire Foreign Exchange situation in ’91 and appreciate that obstructing reform would merely have invited the IMF to impose it on us. I don’t mean to be churlish about Rao’s key role in the implementation of reform but you choose to diminish the great injury he did to the nation by choosing to look the other way when with clear warnings the Babri Masjid was brought down. John Elliott’s column about the Nehru-Gandhi family airbrushing P.V. Narasimha Rao’s legacy is indeed on target. For Nehru, India meant Hindi speaking India – the South Indian provinces were always an afterthought. This is my first time, got a link from FT.com. Not an ardent follower of Politics but I can more than understand what the scenario reflects. A very nice post to read and keep track of whats happening. Your analysis of Rao’s style and especially his mistakes reflect some interesting lessons in management – relations with the key people and being firm on something if they need to be done, immaterial of the scale of opposition. Also, shows how important delegation of authority is. Rao’s confidence in Singh’s maverick policies for a growing India deserves more praise that what it has got. Looking forward to the next post. Thanks. I can’t understand why Congress is so icky about Rao – I suspect this has got something (or all) to do with Sonia Gandhi. She to my understanding shy plays a weird ‘a-woman-scorned’ kind of revengeful character. I have heard lots of similar stories, for instance about why she turned against Bhajan Lal etc. I suspect Rao is also on her list. Maybe she is the modern day incarnation of shrewd Catharine the Great or maybe it’s just another exaggeration, I’ll never know. Very enigmatic character indeed. Very well written article. enjoyed reading it and keeping pace with whats happening and has happened. Thank you.. The wikipedia article on Rao has more, that make him sound a lot more unselfish though. Something about his handing Vajpayee a piece of paper that said “the bomb is ready, go ahead” when handing over power to him in 1996, telling him to keep it quiet. This, after holding off on the nuke test a year earlier, after the NY Times broke the story on India’s nuke tests. Vajpayee revealed this only after Rao passed away in 2004. I have seen statements in more than one place (uncharitable ones to be sure) that said Rao only made Manmohan Singh – known for brilliance as well as being self effacing – his FM so that if the reforms failed, Singh would be left holding the bag, while if they clicked, Rao would get all the credit for being a visionary. Didn’t quite work out that way, I must admit ..
Getting tarred with the Chandraswami brush, besides the Babri Masjid issue ruined the man’s career. All his life, he was a very shrewd negotiator and backroom political operator rather than a lead from the front type. Being a lot more intelligent than previous PMs were, he certainly knew enough to pick enough ministers with real expertise rather than political clout, and that helped. And besides, India had no way to go except up, with the license and permit raj, and coalition governments, having reached its nadir.